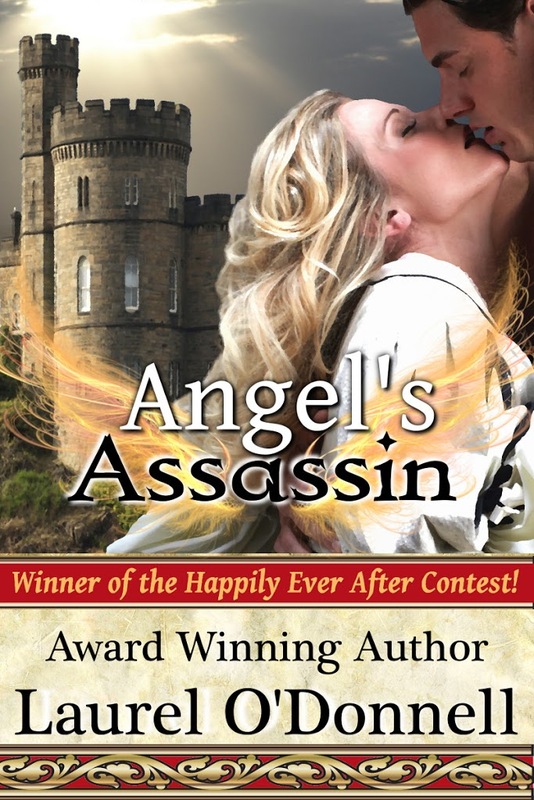 This week I’m happy to welcome award-winning writer Laurel O’Donnell who is going to share a first meeting from her medieval romance Angel’s Assassin. I gotta tell you, this hero has grabbed my attention already. Read on to see what I mean…. Shivers peppered her arms and hysteria threatened to pull her into darkness. Aurora lifted panicked eyes to the tall, dark stranger. He was dressed in black from the leather boots clinging to his muscled calves, to the breeches hugging his powerful thighs, and up to the tunic opening at his neck to give a glimpse of his strong chest. His thick black hair hung to his shoulders in effortless waves. His dark eyes were like onyx. At first glance, they were soulless, as cold and as eerie as the dead man’s lying within an arm’s reach of her. A fleeting niggling of familiarity tugged at the back of her memory. Before her shocked mind could place him, he lifted his hand and held it out to her, palm up. She shifted her stare from his strong hand back to his eyes and saw something else in his mysterious orbs, something deep inside calling to her, beckoning. For a moment, she felt as though he was asking for something from her, as though he needed her. Her soul answered with calm assurance, pushing aside her own fear. She could never resist the urge to assist another. She raised her trembling fingers toward his, drawn inexplicably to his offered hand. “Stand back!” Captain Trane shouted. He appeared in front of her, a large stick in hand. He knocked her outstretched hand aside with his hip, blocking her view of her rescuer. Aurora angled her head so she could see the dark stranger beyond Captain Trane. The stranger’s lip curled in a feral snarl and he lifted his weapon. Aurora accepted his help to her feet. “He saved my life,” she said in wonder. Captain Trane turned back to the stranger. As the stranger shifted his gaze from Captain Trane to her, the contempt burning deep in his eyes seemed to fade and then vanish completely. He lowered his weapon, straightening to his full height. He was a good head taller than Aurora, his shoulders broad and strong. He watched her speculatively. Some might consider his black eyes evil and demonic, but Aurora thought they were beautifully unique. They mesmerized her, intrigued her. He also managed to instill peace in her. As Aurora looked at her would-be assassin, her heart began to pound and her entire body trembled with fear. He tried to kill her. But why? She had done nothing! She was nothing like her mother. “No,” she whispered. The stranger stepped before her, blocking her view of the dead man. He bent down beside Captain Trane and quickly searched the corpse, removing a pouch from beneath the dead man’s green tunic and a long, thin blade from his boot. He tied the pouch at his waist and slid the dagger beneath his leather belt. The stranger used the dead assassin’s green tunic to wipe the blood from his sword. He rose and scanned the area. Aurora followed his gaze. Around them, the crowd of villagers grew, whisperings rustling through them. “What is it?” she asked nervously. “You should leave now,” he said softly. His words, issued with a commanding tone of warning, sent shivers of concern racing down Aurora’s spine. She looked at Captain Trane in confusion. More assassins? Aurora clenched her hands in a tight knot before her. Farmers and peasants gathered nearby, lifting speculative glances in her direction. She recognized many faces. But some she did not. A shiver coursed through her body. She looked at the dead man again. Am I to end up like mother? Fear spiraled through her, coiling around her, threatening to steal her calm disposition and leave her the weeping, frightened child of seven years ago. But when she met the stranger’s gaze once again, his dark eyes infused her with a calming peace, banishing any terror. “I thank you for the great deed of bravery you performed here,” she said to him. The man gazed at her with dark intensity. It was as if he could not stop staring at her. As if…he were confused by something. “You should be more concerned with your own safety,” the stranger advised. His voice, deep and powerful, resonated through Aurora. “You saved my life,” she stated simply. Captain Trane took hold of her arm. “My lady,” he whispered. “We need to return to the castle.” He guided her down the road. The stranger hesitated. He lifted his head to stare thoughtfully at the horizon. His dark hair shifted slightly in a gentle breeze, brushing his strong jaw. When he again looked at Aurora, his eyes shone hard and distant. He opened his mouth as if to answer, but then remained silent as his gaze swept from her eyes to her lips with a languid stroke. When his stare reached her lips, his brow furrowed and he closed his mouth. He nodded his head. Aurora realized she had been holding her breath, worried he would decline. Upon his acceptance, she smiled brightly. “What is your name?” she asked. I have such a soft spot for calm, deadly heroes. Sigh. To find your own copy of Angel’s Assassin, choose from the links below. Keep in touch with Laurel O’Donnell at her website or Facebook page. Thank you for sharing with us today, Laurel!